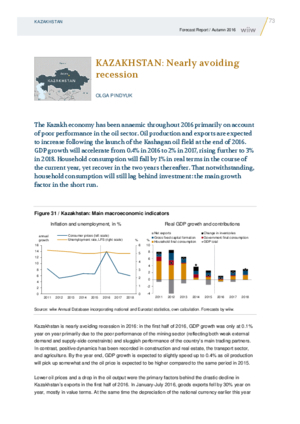 The Kazakh economy has been anaemic throughout 2016 primarily on account of poor performance in the oil sector. Oil production and exports are expected to increase following the launch of the Kashagan oil field at the end of 2016. GDP growth will accelerate from 0.4% in 2016 to 2% in 2017, rising further to 3% in 2018. Household consumption will fall by 1% in real terms in the course of the current year, yet recover in the two years thereafter. That notwithstanding, household consumption will still lag behind investment: the main growth factor in the short term.